Rajasthan CM Vasundhara Raje started her 40-day long Rajasthan Gaurav Yatra. Flagged off by BJP National President Amit Shah from Charbhujanath temple in Rajsamand district, this yatra is aimed at showcasing the works done by BJP in last four years. In fact, during this yatra, CM Raje will carry out several other works. She will make new announcements for the people of Rajasthan. Today is the fourth day of the yatra which began in 4th August. Check out more. 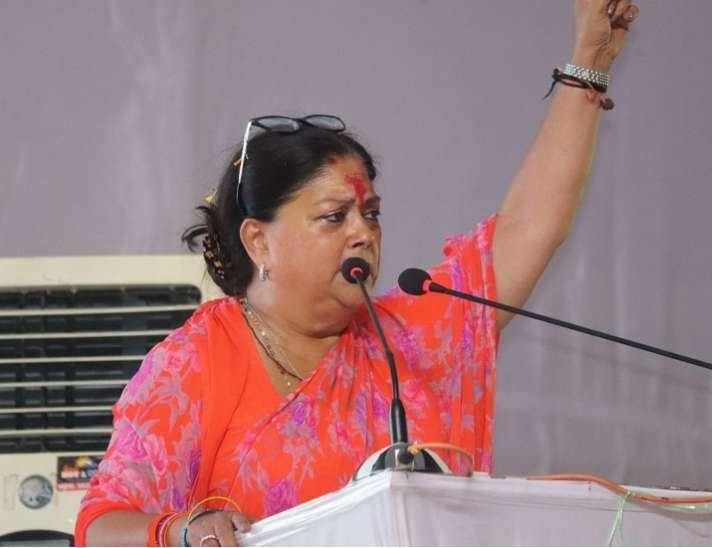 She is in Banswara as a part of her Rajasthan Gaurav Yatra agenda. She reached Banswara on 6th August. Today, she visited many places in the district and got warm welcome. She began her today’s yatra by visiting Tripura Sundari temple. She reached temple by 10:30am and offered prayers there for the prosperity of Rajasthan. Later, she went to Gangadtalai to address the public. How did her yatra proceed? After this, she got a warm welcome at Sallapot. Later, she went to Bhilkua and Sajjangarh where she got warm welcome from the people. As her chariot proceeded, she reached Dungra Bada and Dungra Chhota. People welcomed the CM of the state. From there, she moved to Dusshera ground, Kushalgrah and addressed public. At places like Khujra, Kotra Ranga in Kushalgrah, this prestigious yatra welcomed by people. Other places in route of her yatra are Barwala Rajia, Kherawardipada and Ambapura where the yatra was welcomed. At Vagad, she declared the holiday on the occasion ‘World Tribal Day’and announced to celebrate it as Tribal Welfare Day. Apart from this, she announced free electricity under 50 units to BPL TSP area. She thanked everyone who came to the public meet and supported her in tenure. She further asked for people’s support and asked them to take decision wisely.